Who doesn’t love a party? 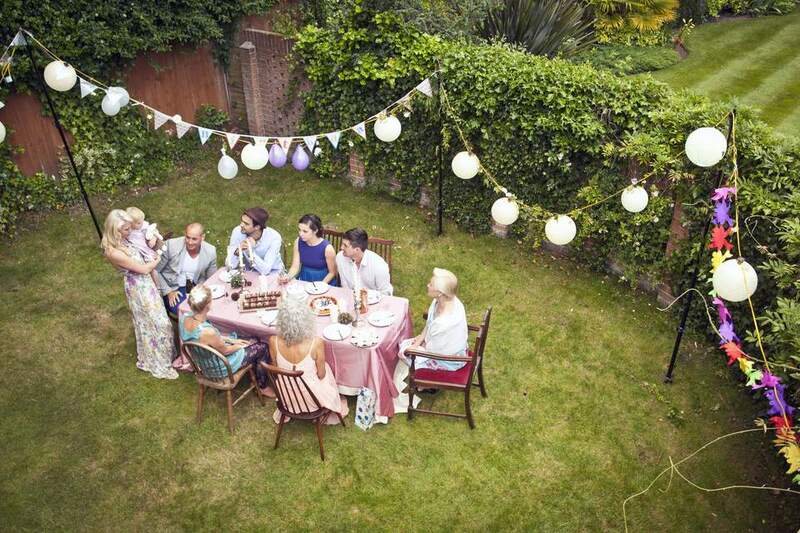 Yet the cost of entertaining often stops a party planning session in its tracks. But there are ways to throw a fabulous shindig without breaking the bank. With ​these fun yet cheap party decorating ideas and inspiring pictures of party decorations, you can be the host with the most and still have money leftover for the food. A simple decorative buffet may be the only party decor you need, or do like this party planner in the photo and showcase the dessert table. On a tight budget? Forgo fancy (and expensive) dishes and craft your own. Check out the pedestal bowls in the photo. You can make pedestal bowls from melamine bowls glued to spray-painted candlesticks. Simple, frugal, yet gorgeous! Nature makes the perfect party backdrop and natural beauty is decorative enough already, so you won’t need many enhancements to make your party pop. Make sure you offer some seating and a place for guests to set a drink, but depending upon your outdoor space, you may not need much more. Any additional outdoor party decor is up to you. What is a party without balloons? If you blow them up yourself, balloons are very inexpensive to use. Choose primary or bright colors for a youthful look, or for more mature party goers, stick with one or two colors. Hang balloons from the ceiling with curling ribbon or string, scatter them around on the floor, or use the balloons to create a fun shape (like the birthday number) or backdrop on the wall. Soft lighting creates an instant intimate and fun party vibe…and it hides dust bunnies and a lack of other decorations, too. Scatter candles of various heights and sizes about your space, using more lighting around tables and food areas. Bright colors can make anyone think, “Party!” And with the plethora of dollar store paper goods and free printables, you can decorate for a party without spending the big bucks. Concerned about the waste? Make it a greener celebration by recycling papers like brown paper bags into fun party bunting or decorations, or search for used (and free!) party goods on freecycle.org or Craigslist. You don’t need a dining table that seats 20 when the floor will do. Create a casual and intimate atmosphere by crafting a party space with floor pillows and an occasional table. This type of party scheme is perfect for simple cocktails and small finger foods, saving you money on food, too! Don’t worry if you don’t have glassware or silver for 12. Mixing your stemware, plates, and other dinnerware creates texture and interest and can actually be party decor in itself. For a festive wine and cheese party, tie satin ribbons or cloth napkins around the wine necks and serve cheeses and crackers on slate tiles. (Just make sure to clean the tiles first.) Done! If tons of color is not your thing, go with a one-color decor scheme. White is one of the simplest color schemes to pull off and one of the cheapest. If you need to impress your boss, it may be less expensive to rent linens than to buy them, but don’t forget to check fabric stores. Burlap or muslin is very inexpensive and can make wonderful party decor, no sewing skills required. Most fabrics look fine frayed around the edges and work well for napkins, tablecloths, and table runners. The beauty of this decor is that there isn't any! It's easy and super inexpensive to go with a natural look for your party, yet it's also a very chic look. This simple tabletop completes the party decor with wooden serving dishes, simple foods, and an inexpensive flower bouquet. If you aren't a city dweller, wildflowers make a wonderful (and free) addition to any party decor. Remember: The most important element of your party is all-natural fun. If you are having a good time, your guests will, too. The best thing you can do at a party is to concentrate on your guests and make them feel welcome. If you do that, they’ll never notice your decorations…or lack thereof.